DOES PRESSURE TREATED WOOD CONTAIN ARSENIC? I recently had some decks and exterior stairs at my properties replaced using pressure treated lumber. I get questions about pressure treated lumber from tenants quite often, and with good reason. Pressure treated wood used be a very toxic product. For a long time, pressure treated wood was infused with Chromated Copper Arsenate (CCA). As the name implies, it contained arsenic. If termites ate wood that was treated with CCA, they would die. One of the many dangers of CCA was that the arsenic in the wood eventually leached into the nearby soil and poisoned the ground. Pressure treated wood no longer contains arsenic. The federal government banned arsenic in pressure treated lumber in 2003. The History of Arsenic. People have known since ancient times that arsenic is highly toxic. 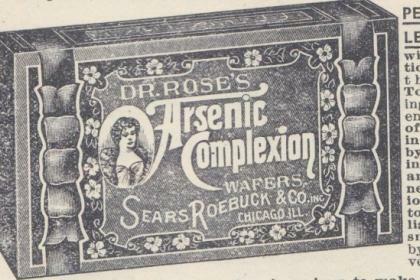 Nevertheless, at the turn of the 20th Century, arsenic could be found in hundreds of household products. Arsenic was commonly used as a dye to make clothing and paint bright green. Many people died as a result of that. Women who wore green dresses in the 19th Century often became sick and died from the arsenic in their clothing. Weavers and dyers also became sick and died from handling thread all day long that was soaked in arsenic. Napoleon Bonaparte died of arsenic poisoning. That has been known for a long time, but until recently, no one knew where the arsenic came from. A lot of people suspected that his English jailers put arsenic in his food, but that isn’t what happened. When Napoleon was living in exile on the island of St. Helena, his friends in France had his bedroom wallpapered to make the room look more cheerful. That house still stands. The wallpaper in Napoleon’s bedroom was recently tested and found to be loaded with arsenic. It is now believed that the arsenic in Napoleon’s wallpaper gasified in the warm humid climate of St. Helena and killed him. A lot of people in Europe and America died that same way in the 19th Century. 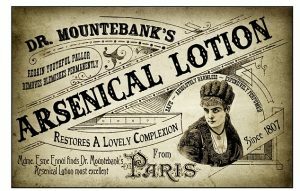 A lot of cosmetics sold in early 20th Century also contained arsenic, like arsenic face cream, which was sold everywhere. Smearing a blemish on your face with arsenic cream will actually make the blemish go away – but at a price. Arsenic face cream will eventually kill you. 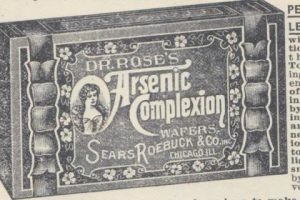 Cosmetic companies also sold arsenic wafers, arsenic pills, arsenic shampoo, arsenic hair tonic, and arsenic soap. When Teddy Roosevelt created the FDA (Food and Drug Administration) in 1906, one of the first things they did was ban arsenic, mercury, and lead in cosmetics. 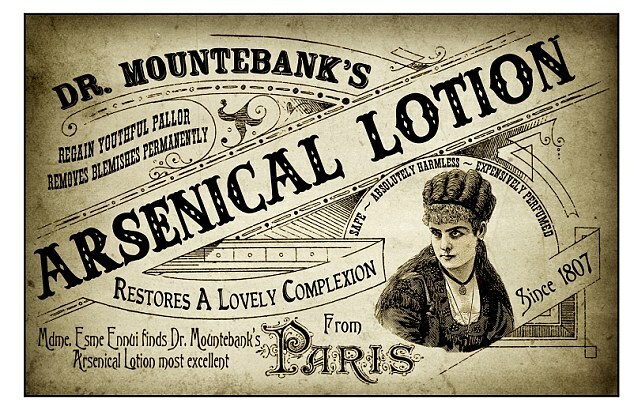 As a result, many cosmetic companies went bankrupt. Today, there are still some consumer products on the market that contain arsenic. The FDA is still debating whether to ban arsenic from commercial chicken and turkey feed, where it is still in common use. Don’t eat tomatoes grown in arsenic. (That’s actually good advice.) A few years ago, a tenant of mine on McAuley Street showed me tomato plants that she grew in her garden and offered to give me few of them. Her tomatoes looked really beautiful, but I noticed that her tomato bed was full of ant stakes. I recognized the brand and knew that they contained arsenic. I told her the truth about this product and that I don’t eat vegetables grown in soil with arsenic in it (and neither should you!) I know that I disappointed her, and I felt bad about that. I know she put a lot of work into her tomato garden – but arsenic really is very bad stuff. A very small amount of arsenic can kill you. Historically, arsenic poisoning was a common method of murdering people. That’s because until the late 19th Century, there was no way to chemically test for arsenic poisoning, so it was very hard to prove in court. Also, the symptoms of arsenic poisoning can be vague – headaches, dizziness, drowsiness, etc. These are conditions that could have a long list of causes. When in doubt about chemicals that you use in your garden, read the label. If a product contains arsenic, they have to state that someplace on the package. Don’t underestimate the danger of arsenic. Just because a product is legal doesn’t mean that it is safe. This entry was posted in Tenant Newsletter and tagged atsenic, poison, pressure treated by Mark. Bookmark the permalink.